Umstead has been a popular place for hikers and runners for decades. Since it became a state park in the 1930’s, an untold number of nature lovers have enjoyed its rocky hills, meandering creeks, and towering trees. Lovers of a different sort have also passed through quite frequently, and their path remains for as long as the trees remain rooted to the earth and sky. It’s hard to say how many couples have walked hand-in-hand along the dirt trails over the years, but we know that some have left behind small pieces of the emotional highs they must have felt. 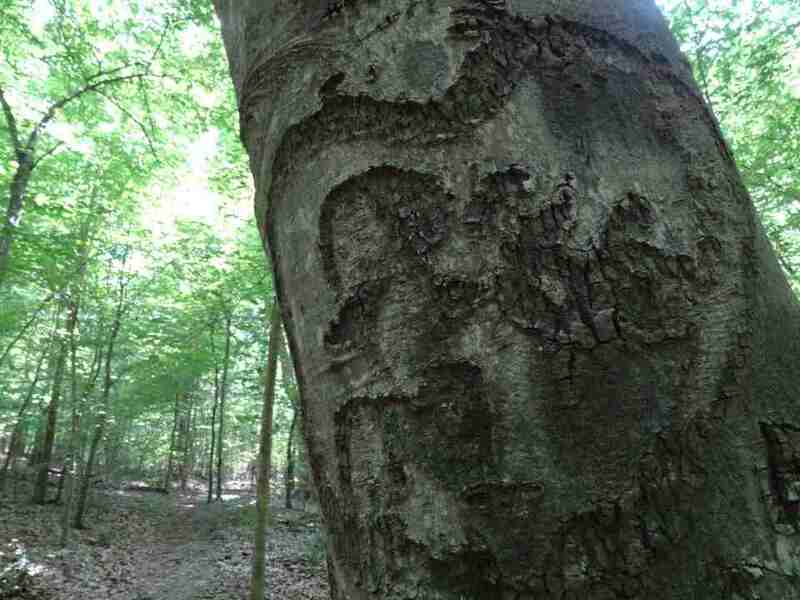 Walking along the Pott’s Branch Trail, it’s not rare to see carvings in the trees. 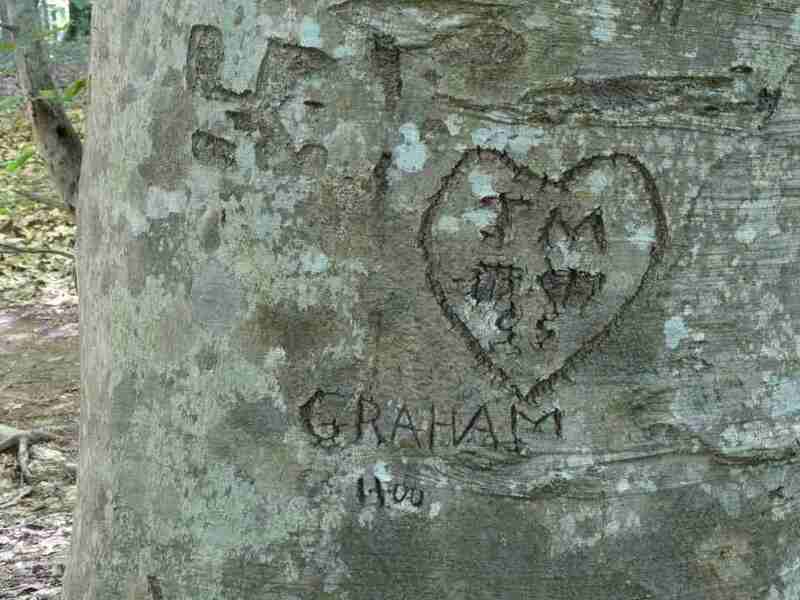 Initials, dates, and hearts dot the trunks like a romantic roadmap through Raleigh’s history. 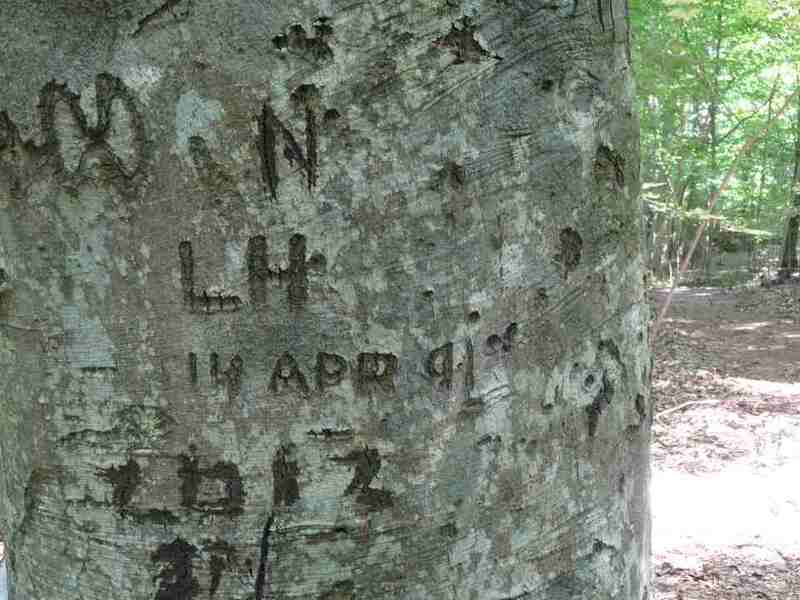 These initials were carved in in 1955, when Raleigh was getting over the thrashing it’d received from Hurricane Hazel. Although ninety-five people in the United States died because of Hazel, the storm helped ease the severe drought that had plagued the southeast, refreshing the plants and wildlife. It was a time of social turmoil, and in 1955 Umstead was still segregated from it’s southern neighbor, Reedy Creek Park. Jim Crow laws still held sway over public facilities, but it wouldn’t for very much longer. I wonder if people felt the change in the wind, much like the crisp air after a storm? Perhaps the couple who left their initials here were thinking about the future, and how it would change for the better. In 1966, the year this couple etched their love in time, Umstead merged with Reedy Creek to end segregation. Social turmoil continued despite the passing of the Voting Rights Act, but Raleigh would show off its progressive side and soon elect its first African-American Mayor, Clarence E. Lightner. It was a time of great positive change. The letters here are illegible, so much so that they look more like a wizard with a floppy hat than sets of initials. 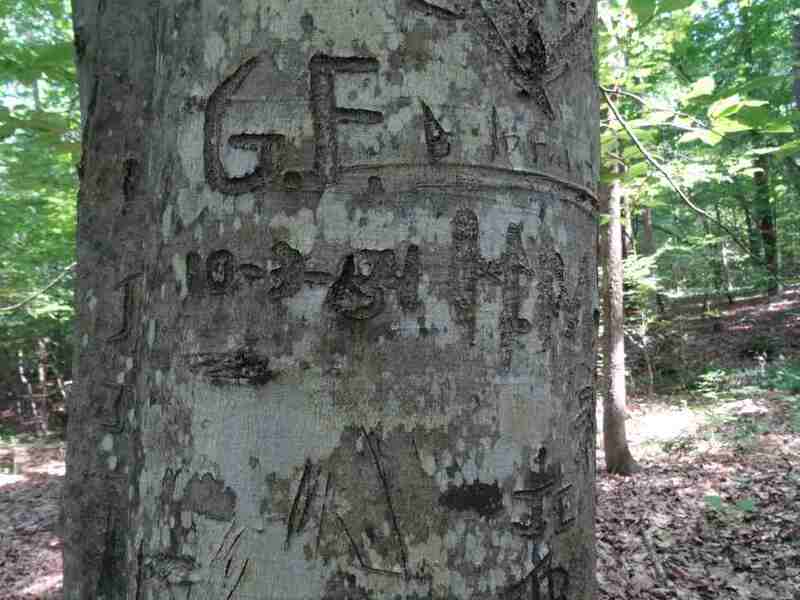 It’s possible that the tree has grown in ways that blur the letters, but it’s also likely that someone came back later and scratched out their name. Perhaps the summer of love wasn’t so lovely after all. The Village People skyrocketed to fame with their biggest hit, “YMCA,” in 1979. 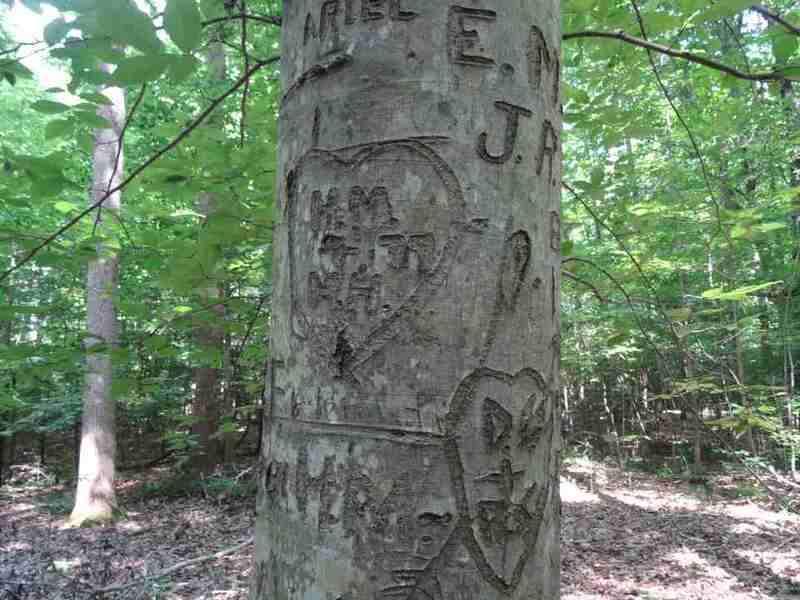 Was this couple humming this catchy tune as they carved their initials? Was their song sung along the brand-new I-440 as commuters went to work? Did people dance to disco’s greatest contribution on the redesigned Fayetteville street? It seems so long ago. Maybe H.M. and M.H. 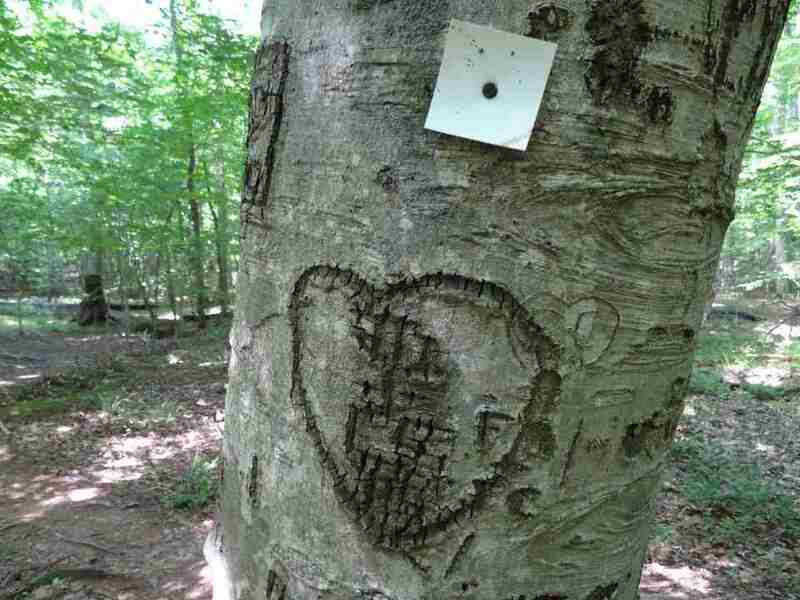 were humming to “Macho Man” as they carefully cut into this trunk to let the world know their love. Or maybe not, it seems like the type of lovers willing to permanently inscribe their love in nature would listen to something softer and gentler. 1984 was a dangerous time for lovers. Researchers had announced the discovery of the AIDS virus, and lots of misinformation spread. Workplaces, religious groups, and even families ostricised individuals with the disease. Homosexuality was widely blamed, and it has taken decades since to erase that blame. It’s unlikely that G.F. was affected by the AIDS scare, but it’s telling that whoever left their initials here decided that it was better to walk the trails of Umstead alone. 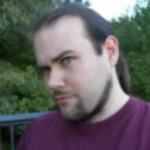 Also, on a slightly more chilling note, it’s unclear what happened to M.H. 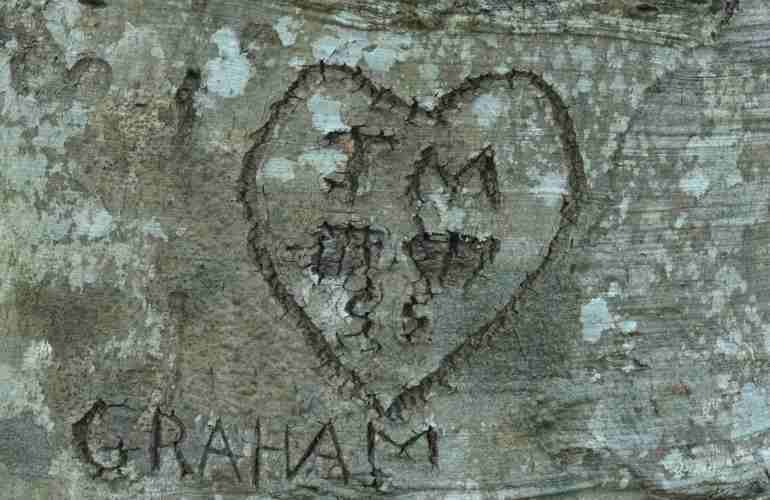 It’s possible the couple from five years earlier carved their initials in multiple trees, or that this H.M. could be a different person, but it’s a little troubling that M.H. is nowhere to be found. The Triangle’s growth started kicking into full gear in the 1990’s. We were thriving in an economic bubble, and Raleigh was in a better position than ever to take advantage of that growth. The two bank towers, the Wells Fargo Capitol Center and Two Hannover Square, were both opened in 1991. A man named Jim once passed by this spot on May 10th, 1991. That’s all we know. Was he truly alone, like G.F? It’s hard to say for sure, but the 90’s were a time of great hope and promise. Perhaps he left space to the right of his name for a reason; one day, Jim may have thought, he’ll bring the girl of his dreams back here and complete the carving. He could come back again and again with his girl and say “I loved you before I even knew you.” It’s been 23 years. Let’s hope Jim found that love and just forgot about the tree. Two years ago, How I Met Your Mother was still on the air. The Walking Dead and Game of Thrones were receiving critical acclaim. The economy had suffered greatly, and everyone in the Triangle was turning to well-written television to mask the reality of political scandals, income inequality, and TSA shenanigans. It was a time of uncertainty, as it is today. The letters below the year are nearly illegible and unfinished, almost as if the person scrawling them was uncertain if he or she wanted to finish. 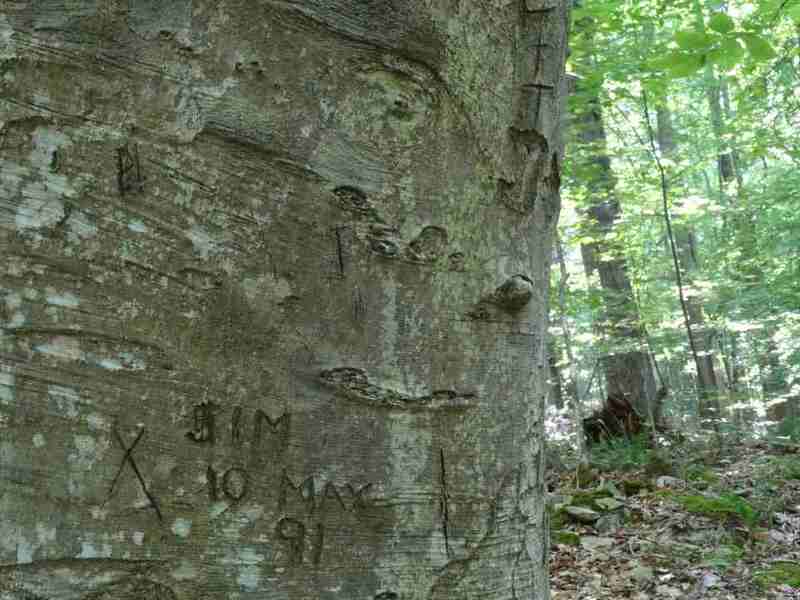 Perhaps their significant other was standing next to them all the while, and convinced them to stop carving out of respect for the tree. Or maybe it started raining and the person was rendered unable to finish. Whatever the case, we’re left with the year and many possibilities. However, possibility and uncertainty stretch far back throughout human history. It’s nothing new, and our ancestors somehow got through each day of their lives. Sometimes we try to go at it alone, but we’re better people when we have someone else there beside us to help carve initials when our hand starts aching. That’s the truest statement I can make about any of those who have left their mark in Umstead over the last century. We may never know who left them, we may not even know exactly when, but we know why.